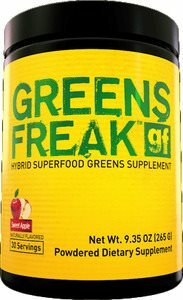 Greens FREAK contains the three key green superfoods: (1) alfalfa grass, super for immune system support (2) barley grass, super for high amounts of vitamins and enzymes, and (3) wheatgrass, super for being a powerful detoxifying agent! As a dietary supplement, adults take 1 scoop daily to support micronutrient needs. Mix 1 scoop with 8 ounces (237 mL) of water and consume immediately. You must be an active registered customer and Signed in to comment.